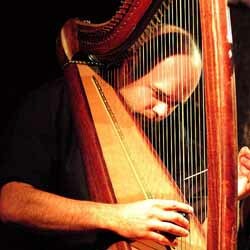 Davies is an improvising harpist who confronts traditional concepts of the harp through his use of preparations, detuned, bowed and e-bowed strings. Influenced by live electronics, music-concrete and electronica he is particularly interested in exploring noise, silence, texture and abstract sound on his acoustic instrument and especially working with musicians who utilize electronics. He has been based in London since 1995. He has since performed in America, Japan, Canada and Europe. Regular Groups include; Broken Consort; Cranc; The Sealed Knot; Apartment House; Davies/Patterson/Toop. M, Toshimaru Nakamura, Jerome Noetinger, Taku Sugimoto, Annette Krebs, Sean Meehan, Andrea Neumann, Otomo Yoshihide and John Zorn. He also performs and researches contemporary classical music. He has commissioned the following composers to develop new works for the harp; James Saunders, John White, Catherine Kontz, Michael Parsons, Laurence Crane and John Lely. As a concert promoter he co-ran with Mark Wastell the series of concerts ŒAll Angels‚. Some of the music played at the series can be heard on ŒThe All Angels Concerts 1999-2001‚ CD on the Emanem label.